The customer is an asset to the business. Business can only grow if you have customers. Without customers: no profit, no business. The customer should be the focused and central point of a business plan because he/she is the individual who is going to purchase your product or avail your services. The customer is the most valuable and central point of every business who must be focused upon while formulating strategies to improve the business success rate. Establishing and maintaining excellent customer services is the critical step in a successful business plan. Customer services require that all customers are equally valuable and you have to understand the expectations of customers. Your products and services should fulfill the needs and wishes of customers. All customers should be dealt with respect and attention. Communication with customers should be effective and business owners should listen to them whenever they need your help. Issues of customers should be resolved promptly and they should always be asked for feedback. Everybody believes that their opinion is valuable. When you ask customers for opinions or suggestions, they feel themselves valuable and privileged to be customers of such a high standard company. Take their opinion as advice for improvement and make adjustments. In case of any loss or damage, a compensation policy should be there for customers. Happy customers are assets of a successful business and should be tracked by using CRM software. This software is used to track sales. Respond to all emails from customers immediately. The value of customer service for the business. How should these expectations be fulfilled? 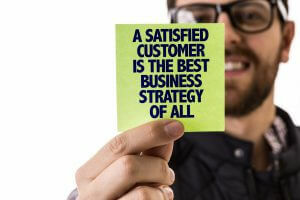 Ways to satisfy and make customers happy. What are the roles of each employee in delivering excellent customer service? This training is an ongoing process. All new employees should be trained step by step while refresher training should be scheduled for seasoned employees periodically. Train employees in such a manner that they show commitment to deliver customer service at their best. The more you emphasize wonderful, committed customer service, the more satisfied your customer will be. Once the entire team is well trained, begin reinforcing the value of customer service expectations. The more you emphasize your expectations of customer service, the more committed the employee will be in delivering excellent customer services. Bookkeeping data will help you trace the value and size of transactions made by various customers and how each customer’s buying is affecting your business. Use CRM software to track satisfied customers. Providing them great services ultimately increases the growth of the business. Any flaw or weakness in customer service is the failure of business planning. It has many reasons. Either all employees didn’t get enough and appropriate training to deliver services according to customer expectations or employees are not well aware of the value of customer service due to lack of emphasis and reinforcement by the trainer. Another reason is that the company doesn’t have the proper well-established system for customer service monitoring related queries and feedback. Also, any employee that failed to deliver customer services efficiently that have not been fired by management is a failure in business planning. Analyze shortcomings and overcome all to flourish your business. Any errors related to customer service can be forgotten and forgiven if the customers you have see that you have improved your systems and processes. Classification or grading of customer service cannot be done without having standards. Develop standards and train employees accordingly. Unsatisfied or grieved customers often leave your business without complaining. This is the real loss of your business. The satisfied customer will remain your customer for a longer duration and refer others to you. This is the key to success of the business. Customer service should be excellent to win the loyalty and trust of the happy customers. This is crucial for the growth of the business.